1.Wash and pat the pork chops. Mince the ginger and shallot and blend in the marinade to mix well. Season to taste then immerse the pork chops to soak for 20 minutes. Turn over and marinate the other side for 20 minutes. 2.Shell and beat the egg in a bowl. 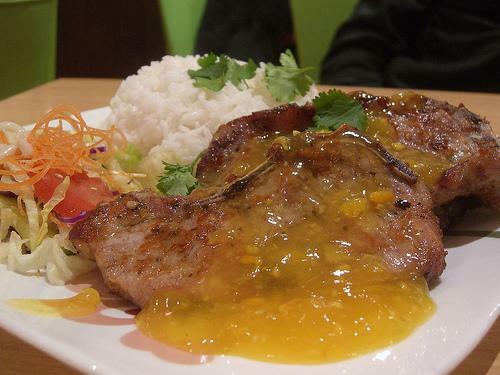 Dip the pork chops in the beaten egg to coat evenly then dust with the cornflour. 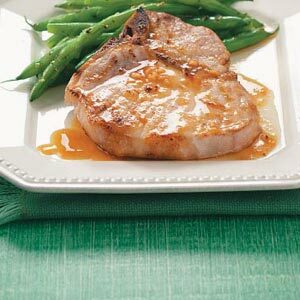 3.Deep fry the pork chops in the boiling oil until golden brown. Remove, drain and arrange on to a platter. 4.Mix the orange juice with the other gravy seasoning. Heat a small saucepan and pour in the gravy mix to simmer over low heat. Continue stirring with a wooden spoon until gravy thickens. Stir in the cooked oil and pour over the pork chops. Garnish with the orange slice and serve.